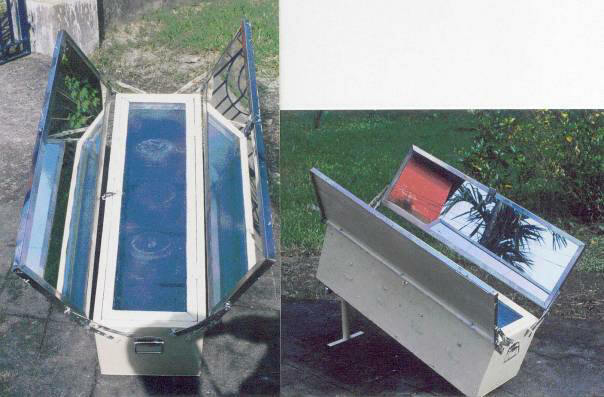 Several types of solar cooker have been described in different books and literatures. In the present investigation a highly efficient inclined box solar cooker is designed and fabricated Details constructional feature of the cooker are described. The test results obtained so far are encouraging. The proposed cooker can readily be put into use at its present state. Solar cooker available, generally fall under two categories. One is box type and the other is parabolic reflector focusing type .The cooking ability of existing box type simple solar cooker is seems to be not satisfactory in comparison to the cost involved. .Parabolic reflector focusing type cooker needs frequent adjustment to track the apparent motion of the sun .For these reasons this type of parabolic reflector solar cooker is not much popular. In the proposed box type cooker beam radiation is always perpendicularly accessible for its adjustable inclined position and for convenient implementation of two reflectors the cooking time is remarkably reduced than that of a usual box type cooker. The cost of cooker is however, slightly higher than usual box type but it can be considered reasonable in respect to its improved performance. The detailed constructional feature of the cooker is shown in Fig-1.The cooker box consists of a top open black painted inner box kept inside of the another box and the space between the two boxes is filled with glass wool insulation. The upside of this cooker box is covered by two layers of transparent glass keeping a gap in between and the supporting frame of the cover is hinged with cooker box for keeping glass cover in inclined position to handle the cooking pots. So the cooker box is similar to conventional box type cooker, but the shape of the box is different from common type. The length of the box in presently proposed type is at about three times of its width and depth is equal to the width. The cooker is to be placed facing sun, keeping longer side vertically inclined position and the inclination of the cooker box can easily be changed from 15 degree to 45 degrees with respect to the ground by the adjustable stand, attached at the back side of the box. Two mirror reflectors are used in this cooker, however even up to four reflectors can be conveniently arranged in this box type cooker (provided the reflectors are light weight). 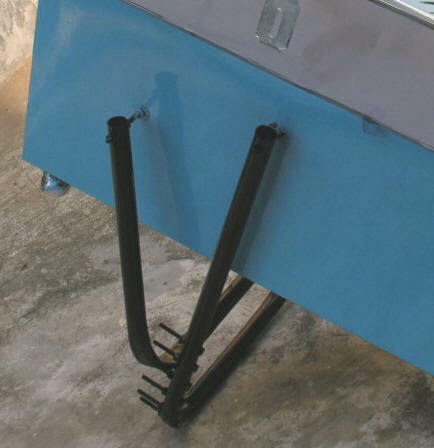 The reflectors are set along the length of the cooker box cover, one in each side, by hinge and holding strip. So length of reflectors are equal to the length of the glass cover .The widths are equal to the width of the glass cover .When the cooker is in use, each reflector is kept at the inclination of about 115 degree with the face of the box cover .In this position the reflections from the top edge of the reflectors touch the outer longitudinal edge of cover glass when the cooker is placed in perpendicular direction to the solar rays .If four reflectors are used then other two reflectors are to be hinged at the top of the inner reflectors, one in each side at an angle of nearly 15 degree with the inner one All the reflectors can be folded for keeping on the top of the cooker box cover when not in use. The face of the cooker is to be placed perpendicular to beam radiation to collect the maximum energy. This perpendicular position can be easily achieved simply by the rotation of the cooker towards the sun with the help of caster wheels ,suitably attached at the bottom side of the cooker and by changing the inclination of the cooker by adjustable stand of the back side .But the position of the reflectors remain unchanged throughout the working period. Four number of black painted aluminium cooking pots are used and are placed side by side at the longer side of the cooker on cooking trays. For each cooking tray two bolts acted as hinge are fixed at both longer sides of the cooker inner box. The cooking tray is suspended from the end of the bolts through M.S strips. Length of these strips is equal to the cooking pot radius and these strips are fixed with the ends of tray aligned with the exact middle position of the tray as shown in Fig-2. When the cooker box inclination is changed the cooking tray along with cooking pot, for its own weight, rotated around the bolts and always remained in horizontal position. To avoid the chance of tilting of pots, square shaped trays, length of which are kept equal to the diameter of pots are used and ends of the trays are folded upward. i) Almost 90% of the energy collected by a solar system occurs between 9 am to 3 pm .The provision for changing the inclination of proposed cooker from 15 degree to 45 degree with the horizontal is sufficient to collect direct solar radiation perpendicularly throughout the mentioned period. Thus radiant energy falling per unit aperture area of the cooker face is increased than if the cooker is placed horizontally like conventional box type cooker .Also transmissivity of the cooker glazing is increased for its perpendicular position with the beam radiation. 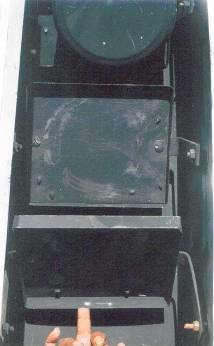 ii) In this cooker system with two reflectors ,energy collection is high and even four reflectors can be conveniently used to concentrate solar radiation similar to tracking reflectors ,but without the hazards of frequent manual adjustment to follow the apparent motion of the sun. G.I.sheet, Aluminium sheet, M.S. Channels , Glass , Mirror ,Asbestos fiber Sheet, Glass wool, Caster wheel, Black board paint, Hinge , lock , Screws and other miscellaneous items . Hand saw, Hand shear, Portable drilling machine, Hammer, Screwdriver, Pliers, Measuring tape Painting brush etc. Approximately Rs.2000 per cooker, including materials, cost of fabrication etc. In fact the cost is expected to be less to some extent if a number of cookers fabricated at a time. Additional Design Feature--Provision or keeping cover plate in inclined position (opened -Position) with respect to its closing position by use of hinge. Depth of hinge (for suspension of trays) from inner box top: 65mm. iv) Leakage test of lower side of cover plate (after boiling of water in cooking pots by solar heating and then by keeping the cooker in shaded location to allow the vapour to condense, there should be no sign of vapour entry between inner and outer glass sheets of the cover plate): No sign of leakage. Time taken for boiling of 4 liters of water in cooking pots (1 liter in each pot) 105 minutes. Intensity of solar radiation during test: 0.56kw per/sq.mt./per hr. Detailed constructional methodology along with some cost and performance figures are narrated in developing the presently proposed solar cooker. 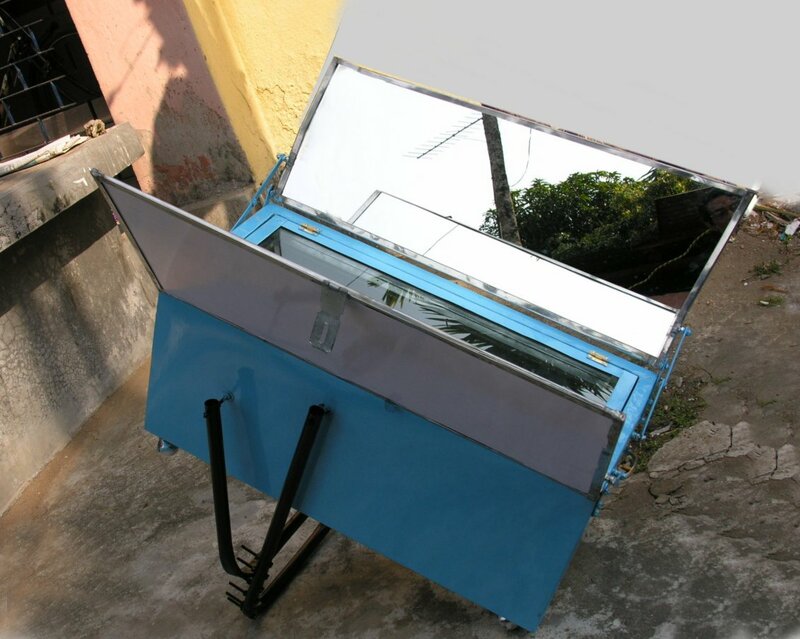 Improved performance over a conventional box type solar cooker is the main feature of this cooker. The cooker, presently fabricated can able to cook 2 Kg rice or equivalent food item at a time within two hours cooking is possible in between 9am to 3 pm.